The morning of March 7, Luther Burbank’s birthday/Arbor Day was lovely! Well, the weather could have been sunny, but not a drop of rain fell to dampen the celebration. 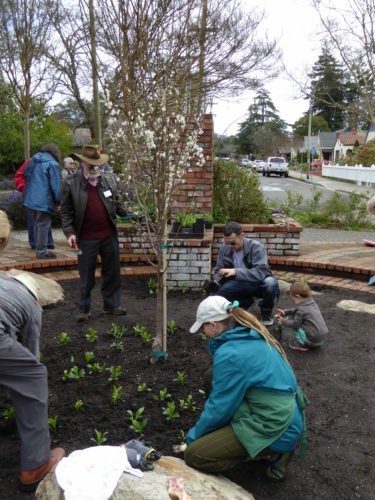 The new ‘Santa Rosa’ Plum tree sported white blossoms and suited its new home in the former fountain site near the Tupper Street gate. The remarks to the gathering were welcoming and brief, before Rachel Spaeth invited the guests who wished to plant little Shasta daisy plants to grab some gloves and a trowel to randomly plant them to surround the tree. They will spread out and be beautiful. I didn’t count them, but 170 plants for Luther’s 170th are supposed to be planted in that bed. Our grateful thanks to Urban Tree Farm for donating our pretty, new ‘Santa Rosa’ plum and to Sequoia Landscape Materials for donating 15 cubic yards of excellent dirt. The ribbon to officially open the new planting bed was cut in several places by City Councilman John Sawyer and Board members, and then people walked into the Greenhouse for some delicious mini-cupcakes iced in Spring colors. Chris Smith memorialized the occasion with substantial mention in his column, including photos, in the March 8th Press Democrat.